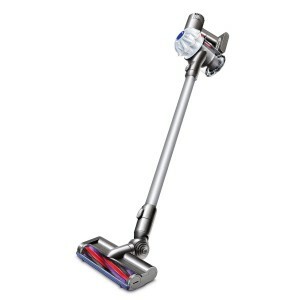 The Dyson V6 comes with a motorized cleaner head that does a great job on all kinds of floors. A well rounded cordless sweeper, this model is capable of cleaning with the same success carpets and hard floors, which is very convenient, since you will not have to purchase different household appliances to be able to clean every room. Well balanced for cleaning up top and down below, the Dyson V6 will keep your entire house clean between routine cleanings with much ease. The most important downside for a sweeper as powerful as this one is the fact that the battery depletes pretty quickly, even when used in normal mode. You get only 20 minutes of vacuuming for a battery charge that takes 3.5 hours to complete. If you plan to you the Dyson V6 for small tasks, this may not be an issue, but if you want to sweep clean the entire home, you may grow frustrated with being able to clean just half the house in one go. Not all the cordless sweepers on the market are doing a fine job for both carpeted areas and hard floors, so the most important advantage offered by this model is that it is designed to work on all floor types. 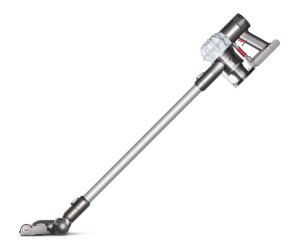 For a model often called the best electric broom from Dyson, this one offers superior performance, regardless of what kind of floor you intend to sweep. You may be surprised to feel how lightweight this model is, while being so powerful. This happens because the V6 engine designed by Dyson manages to balance power and weight with great results. Besides being able to clean all floor types, the Dyson V6 is capable of cleaning ceilings and walls with the same great success. For such a versatile and lightweight model, its performance is really something to write home about. One of the issues often encountered by cordless sweepers is that they cannot deal with a large quantity of dust and dirt because they are not powerful enough. This is not the case with the Dyson V6 that comes with a power adjusting feature that allows you to clean even the dirtiest messes. At maximum power, the sweeper will consume its battery charge in just 6 minutes, but it will manage to save you hours of trying to clean a really stubborn mess. The radial cyclones the model comes equipped with make sure that you will manage to capture even fine dust, so that the cleaned areas remain completely free of allergens. Dyson sweepers are pretty good at getting turned into handheld cleaning devices, and this one is no exception to the rule. The wand detaches with ease, and you can immediately use the sweeper for more focused cleaning. Especially when you want to do just a quick clean-up job, or you have to clean narrow places, this ability will help you out and guarantee results. it, it also holds the extra accessories, so you can have easy access to them whenever you need them.